The kareshi bought this for me as a surprise! 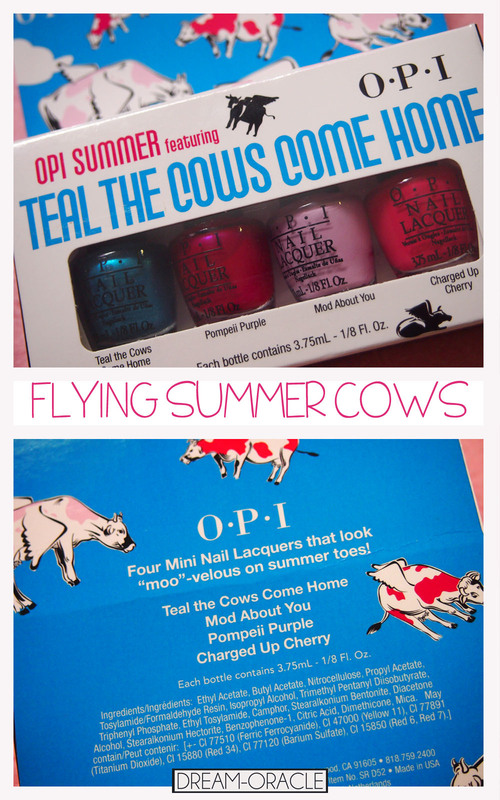 It's my first ever OPI mini collection, so much love heehee..
Ｉlove the flying cows and playful vibe of this collection, so excited to try out the colours. This is the first time I tried doing a colour chart where I colour-picked the shades off my nail, I even attempted to show the shimmers for the top two shades. Not superbly excellent but it still looked pretty similar to the real colours. 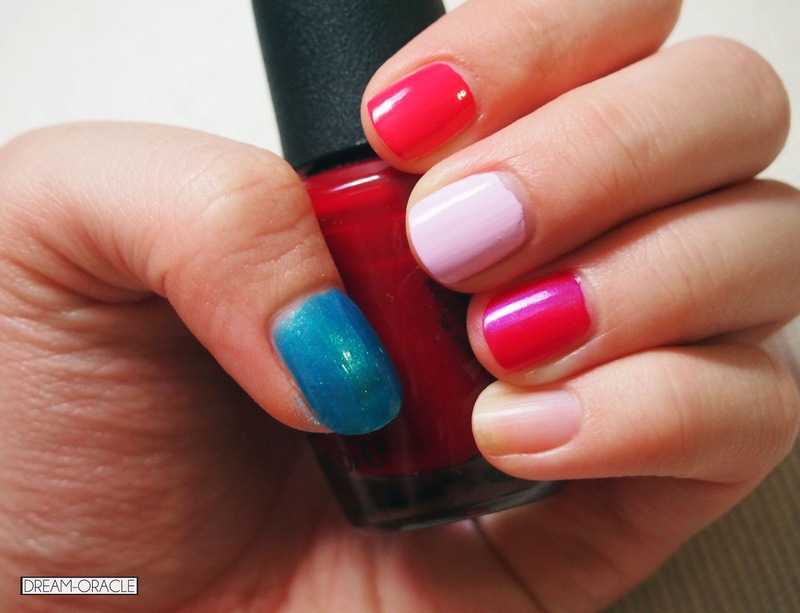 Now let's take a look at the colours on my nails! As usual, OPI colours glides on like a silent skater on ice, very smooth. 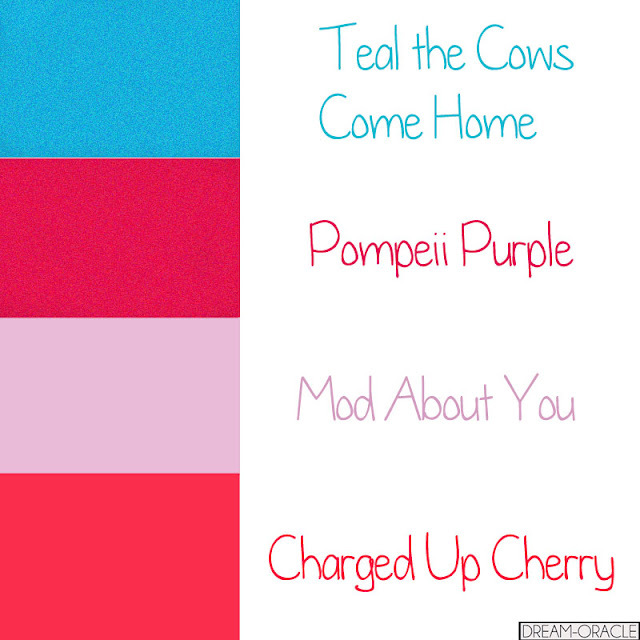 I applied 2 coats for all the colours above, except for Mod About You and Teal the Cows Come Home. Mod About You is a creamy pastel colour and it goes on a teeny bit streaky, so it requires about 3 coats for an even finish. As for Teal the Cows Come Home, the formula is a little on the watery side, so that needed about 3 - 4 coats of polish to completely even out the colour. A closer look at the colours. I don't dig the Mod About You pastel pink on its own, it's too sweet and girly for me taste. I might do something to it, some nail art maybe. I love love love the Pompeii Purple, it's such a flashy colour with slight shimmers. A little like hot pink yet a little like bright purple mixed with some maroon. 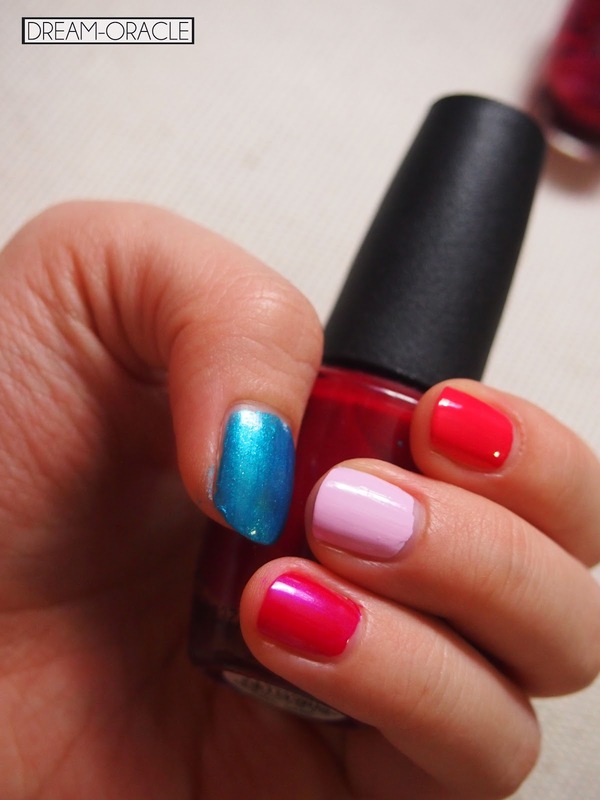 Charged Up Cherry looks so much like this manicure I did for the kareshi's ball last year. But this colour is lighter. Incidentally this is also a OPI colour except I have no idea what's the name of this colour!! Anyone knows? I love this colour, classy and feminine without being tooo girly. In conclusion, I'm loving this collection! A mixture of loud and tame colours, and I adore 3 out of 4 colours from this set. Not too bad.